"A humble beginning" - These words were written almost 60 years ago and were a part of the dedication mass for Our Lady of Perpetual Help Church on August 31, 1947. In August of 1947, the Fathers of the Society of the Catholic Apostolate were invited by Bishop Buddy to assume the work of developing this "parish to be." On August 21, 1947, Rev. Louis E. Del Vecchio, SAC, the first pastor of OLPH, met with the Bishop and together they discussed the newly established parish. Immediately, work began to convert the old army barracks into a small, but devotional Church. This was accomplished in a few short weeks and Mass was celebrated for the very first time on August 31, 1947 at 8 a.m. This first church was located where the new Holy Family Center is today. Although the Church was small, many witnessed the beginnings of OLPH parish as beautiful and devotional. In consideration of today`s parish, one has to admire the wonderful cooperation the parishioners gave to their pastor and future pastors. Father Del Vecchio left OLPH on September 24, 1949; Succeeded by Fr. Francis Leo Kaveney who was pastor from 1949 until October 1955. Msgr. James O`Donoghue became pastor until June 1964. Upon his departure, OLPH was assigned another Irish Priest from County, Galway, Ireland, Rev. Michael E. Flynn. Msgr. Flynn served as pastor until his death on June 19, 1988. At that time (May 1988), Msgr. Neal Dolan was assigned to the Church as administrator and served OLPH parish as pastor for 13 years. On July 1, 2001 Fr. Ronald Buchmiller became the pastor of OLPH and currently serves OLPH in that role. Since the establishment of OLPH almost 60 years ago, there have been able associates to assist the pastors. Fr. Elio Zaratti, Fr. Thomas Gillespie, Fr. Anthony Rodrigue, Fr. Vincent Curtis, Fr. John Keenan, Fr. Charles O`Connor, Fr. Samuel Engl, Fr. Joseph Prince, Fr. Donald Coleman, Fr. Wilson, Fr. Garland, Fr. Michael Murphy, Fr. Walsh, Fr. James Sassone, Fr. James Moffo, Fr. William Stevenson, Fr. Ben Davidson, Fr. Barry Vinyard, Fr. Lucas Thumma, Fr. Anthony Odozi, Jr.,and our very own Fr. Joe Khuyen Van Lai. Fr. Robert Nagler (deceased), Fr. Edward (Bud) Kaicher, and more recently, our very own Fr. Ed Horning, Jr. are some young men from this parish who went on to become priests. In March, 1950 ground was broken for the new rectory with its completion in November. In 1957 groundbreaking began for the new church. The corner stone of the new church was laid in November of 1958. In 1961 Our Lady of Perpetual Help School opened for the first time with 160 students taught by the Sisters of St. Joseph of Carondelet. The first Convent was located in what is now the northeast parking lot and later replaced by what we now know as the St. Joseph Retreat Center. 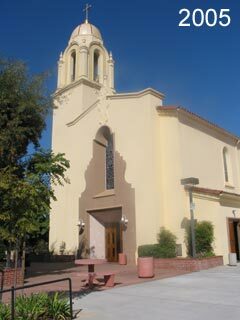 This is where the Holy Family Sisters of San Diego taught the first Catechism classes. Today, High School, Jr. High, and Elementary Religious Education Classes are lead by Sr. Frances Michelle with the aid of Joan Lopez and Donovan Bailey. There are approximately 380 students enrolled in religious education. The OLPH School Principal is Mrs. Jeanne Pate. She and her staff are in charge of approximately 220 students. Connie Finney directs the Adult Religious Education Program. Do You Need a Catholic Website? We build Catholic websites that make a true Catholic difference. Call us if your parish or Catholic organization is struggling to find a deeper meaning for the mission of your online presence.